.Gretchen Knapp, Shawn Patrick Murphy, Megan O'Leary inCharlotte the Destroyer. Photo by DFXDEN. BOTTOM LINE: Charlotte the Destroyer is a new play about a woman and the character she's writing as they both spiral out of control. In Megan O’Leary’s Charlotte the Destroyer, a children’s book writer’s sanity is threatened when the struggle to write her debut novel coincides with the disintegration of her dysfunctional relationship, an attempt to locate her mother, and heavy drinking. 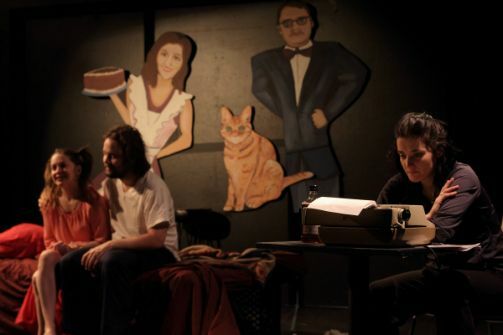 At the play’s onset, Woman is mean and miserable with her drunken live-in boyfriend Man and constantly abuses him, but his lethargy and loserdom save him from any audience sympathy. As Woman fails to meet both her estranged mother and the first draft deadline for her novel, she begins to drink more and her boyfriend begins to distance himself. Woman wrestles with writing Charlotte’s story, the main character of who novel whom she last left as the heroine of her children’s books. But Charlotte as a novel is different -- darker: her parents loathe one another, her father is a failure, and the other kids hate her. As Woman’s book devolves into chaos, so does her life. The couple’s fighting grows worse -- reminiscent of Charlotte’s parents (Woman’s parents?) -- and Woman’s fears and insecurities overwhelm her and estrange her lover. As the author loses control of her own life she also loses control of her prose, and titular character Charlotte takes over. The major point of interest in this production comes from the dual narratives of Woman and the character she is writing. The audience is taken between scenes of Woman’s life and the book she’s writing (ostensibly Charlotte’s life). As Woman sinks further, Charlotte’s world becomes more extreme. Or is it the other way around? We see Woman go from hostile to unhinged as Charlotte evolves from demure to DESTROYER! O’Leary stars in her play about a woman’s devolution alongside Joseph W. Rodriguez, Emily Dahlke, Gretchen Knapp, Shawn Patrick Murphy, and Alex Carmine. The performance is presented by Playhouse Creatures Theatre Company as part of the FRIGID Festival. The production is directed by Janet Bobcean and stage managed by Tiffany Geigel.